In a game that the score resembled more a football score than a hockey game, the Pirates edged the Titans 9-8 in a game where defence was thrown out the window. Trailing 3-0 early, the Titans came back with 2 goals of their own to end the first period 3-2. The Titans scored 3 more times in the second to the Pirates two goals to lead 6-5 heading into the final frame. 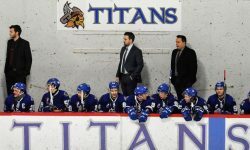 The Titans held an 8-6 lead but watched it slip away as the Pirates scored 3 goals to take the 2 points and a second place tie with the Titans. The Pirates however hold one game in hand over the Titans. Filippo Guaita had the hat trick, Ralfs Circenis and Alex Provost-Ross each collected 1 goal and 2 helpers. Singles came from Dayton Murray, Troy Murray & Axel Hallor. Joakim Braneby had 3 assists. Starter Emile Goulet was forced to leave the game early in the first period and was replaced by Tim Cachard. Shots were 49-26 Titans.